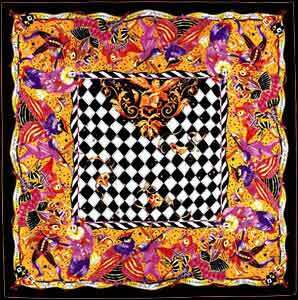 Silk scarves add the finishing touch of style and elegance to any wardrobe. All of our scarves are designed and manufactured by a prestigious firm in Lyon, also known as the French capital of silk, whose models are highly prized and sold under the top French fashion brands. Made of 100% silk twill of the highest quality, the colors (at least 15 to 20 shades) are hand printed one by one for a uniquely luxurious fashion accent. Each scarf is realized like an art piece in every exquisite detail of the motif and stunning array of colors with intense and vivid visual effect. Blend of beauty and quality....all in the best French designer tradition. View designs and select your favorite colors to complement your formal wear or to enhance your casual outfit. Description: Twill 100% silk square with hand rolled hems.